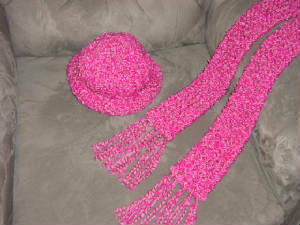 All hats can be made with a matching scarf in color you specify. 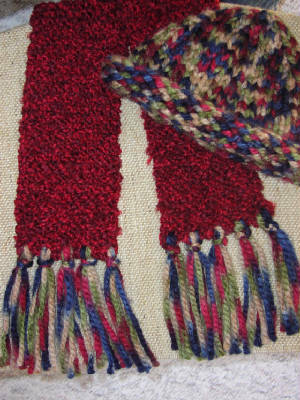 Length of scarf will be approx. 6' long unless you ask for something different...with or without fringe at no difference in price. # 514: It's a beautiful post blizzard day....I've been inside knitting hats and binge watching seasons one through four of Game of Thrones. 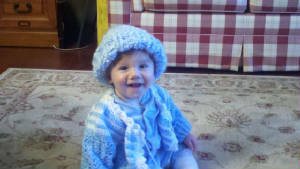 Snow inside and out...so of course a snowy blowy looking hat would be the result! $35. 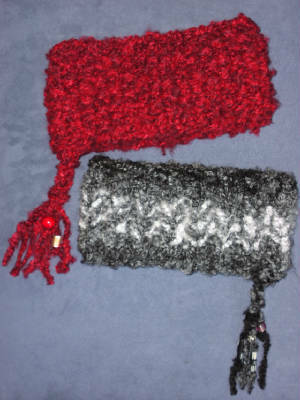 Faux fur and a slightly shimmery yarn used, made with wool/acrylic and polyester yarns. Machine wash only if needed in cold water, gentle cycle. Air dry flat. 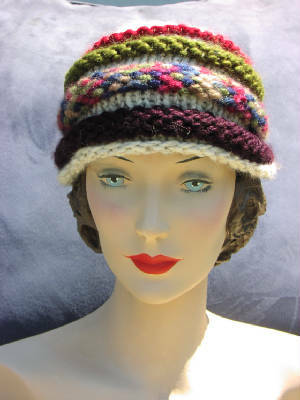 # 512: Wool/acrylic/polyester hat with faux fur trim: $35. Machine wash only if needed in cold water, gentle cycle. Air dry flat. # 511: Wool/acrylic/polyester with faux fur trim: $35. Machine wash only if needed in cold water, gentle cycle. Air dry flat. 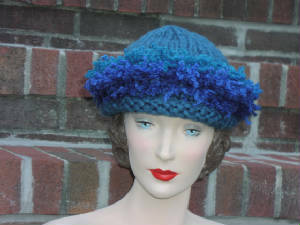 # 507: Really soft, really warm, really fun blue/black faux fur hat with teal and cobalt blue trim: $35. 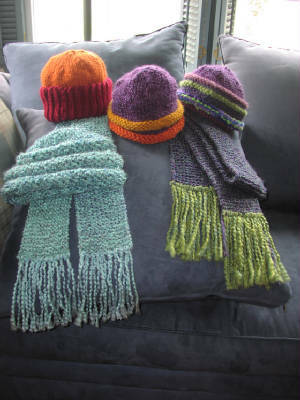 Wool/acrylic/polyester fibers are machine washable if needed in cold water, gentle cycle. Air dry flat. 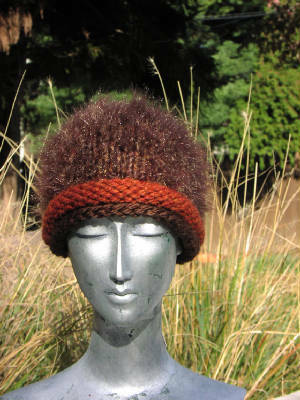 # 508: Warm and soft brown faux fur hat with contrasting trim in "spice" color: $35. Machine wash only if needed in cold water, gentle cycle. Air dry flat. 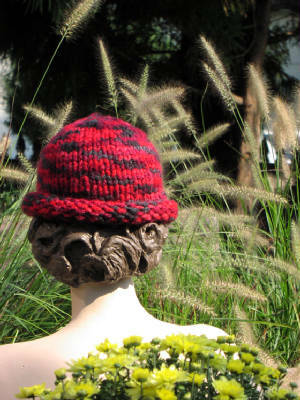 Made with wool/acrylic/polyester fibers. # 509: I love the contrast of this teal/turquoise band with the rust brown and green....wool/acrylic/alpaca fibers are machine washable if needed in cold water, gentle cycle. Air dry flat. $35. 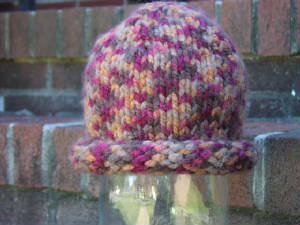 # 510: Warm colors, warm hat.....made with wool/acrylic yarn, can be machine washed only if needed in cold water, gentle cycle. Air dry flat: $35. # 503: A really unusual color combination for me! 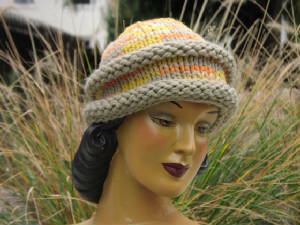 Oranges and yellows accented with taupe, the yarn is called "Marigolds". 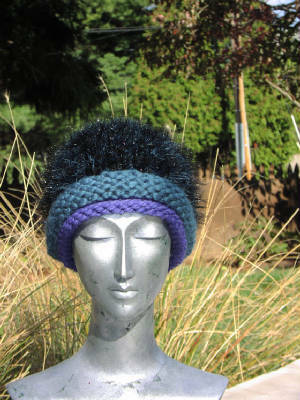 It's a sunny and lighthearted aura to surround you in the cold: $35. 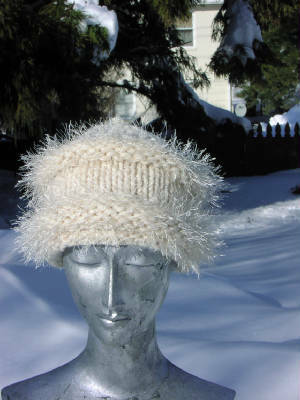 Wool/acrylic fibers are machine washable in cold water, gentle cycle. Air dry flat. 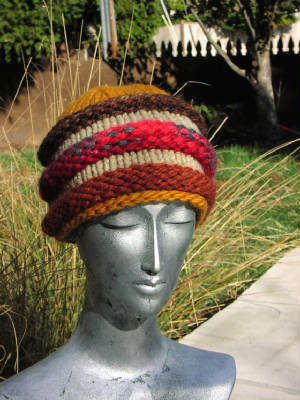 # 492: Wool/acrylic/alpaca hat in warm and cool tones: $35. Machine wash cold and gentle, air dry flat. 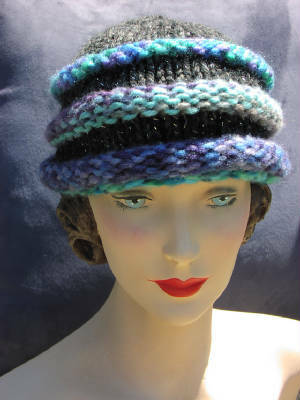 # 491: Wool/acrylic/alpaca hat in blue, purple and green: $35. Machine wash cold and gentle, air dry flat. 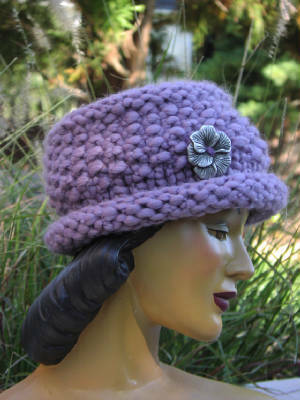 # 493: Wool/acrylic pillbox style hat in "iced mauve", with floral button from France: $35. Hand wash cold, air dry flat. 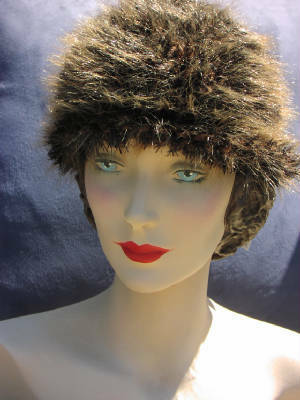 # 500: Glam hat in wool/acrylic/polyester....faux chinchilla fur and silver sparkles: $35. 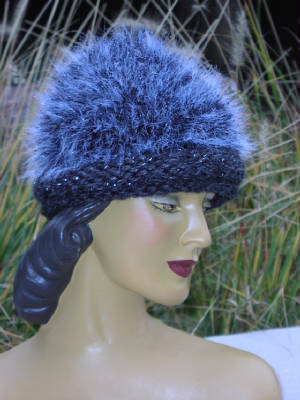 # 502A: Wool/acrylic/polyester charcoal gray hat with silver sparkles and faux fur chinchilla trim: $35. 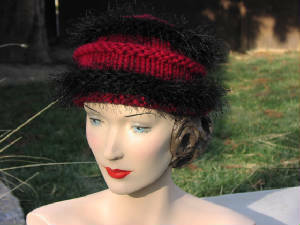 # 502B: Wool/acrylic/polyester hat in red and black....a bit of a Goth feel, really fun! $35. 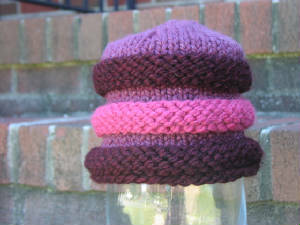 Both hats are machine washable in cold water, gentle cycle. Air dry flat. 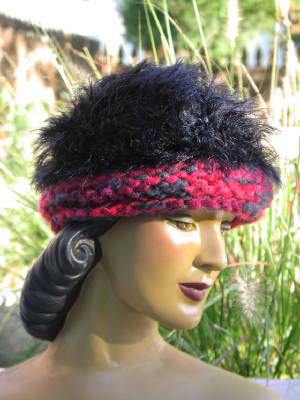 # 418: Black faux fur hat with red multi trim: $35. 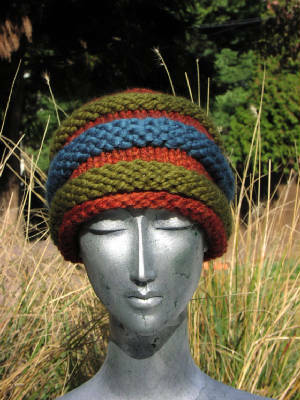 Made with wool/acrylic/polyester yarns. Machine washable in cold water, gentle cycle. Air dry flat. 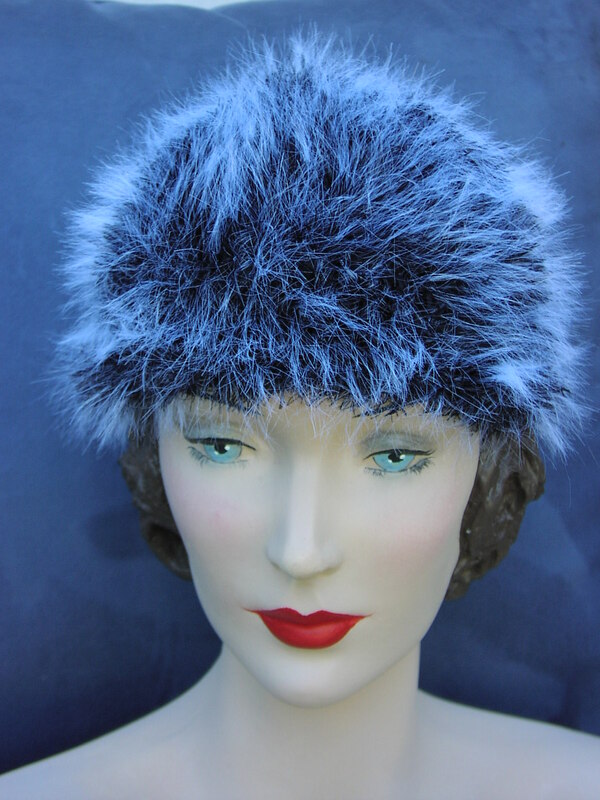 # 450: Wool/acrylic/polyester faux fur hat in "chinchilla:....warm and glamorous! $35. Machine washable in cold water, gentle cycle, air dry flat. 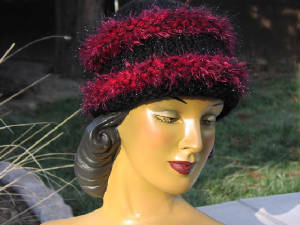 # 409: Wool/acrylic/polyester faux fur hat....very warm and glam: $35. Machine wash cold and gentle, air dry flat. 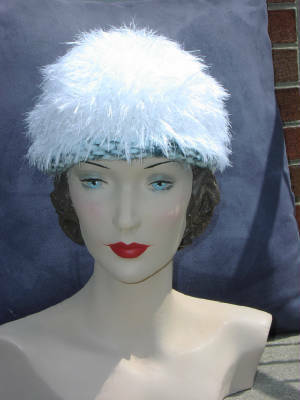 # 456: Acrylic/polyester white faux fur hat with bold trim in sea foam and teal: $35. Machine wash cold and gentle, air dry flat. # 497: Wool/acrylic hat in neutral colors....the yarn worked itself into what looks like an animal print! $35. 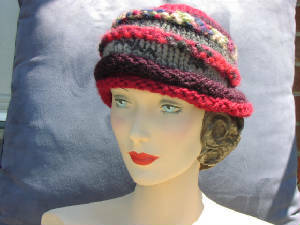 # 498: Wool/acrylic hat in fuchsia, coral, and shades of charcoal: $35. 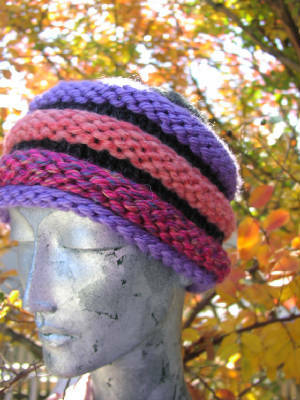 # 501: Wool/acrylic hat in fuchsia, lavender, coral, and charcoal: $35. 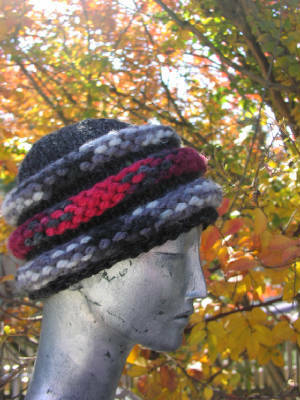 # 499: Super bulky wool/acrylic hat in shades of red and charcoal: $35. 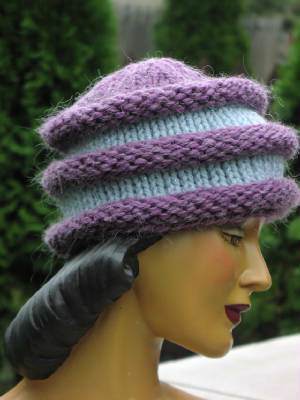 # 489: Wool/acrylic/alpaca hat in mauve and sparkling "glacier" blue: $35. 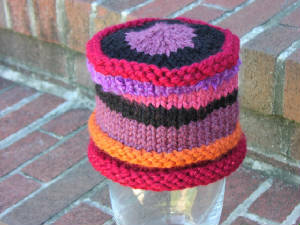 # 460: Shades of red bulky acrylic roll brim hat: $35. Machine washable cold and gentle cycle, air dry flat. 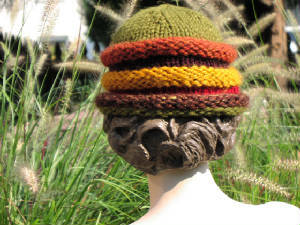 # 461: Autumn colors hat in wool/acrylic: $35. Machine washable cold and gentle cycle, air dry flat. 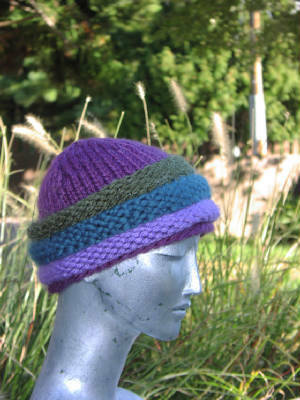 # 457: Wool/acrylic hat....very bulky and warm: $35. Hand wash cold, squeeze--do not wring--excess water. Air dry flat. 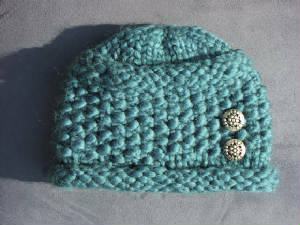 # 427: Soft teal pillbox shaped hat in wool/acrylic yarn with floral buttons from Italy...a very classic look in a warm hat that comes down low enough to warm your ears (as do all my hats): $35. Hand wash in cold water, gently squeeze--do NOT wring--out excess water, air dry flat. 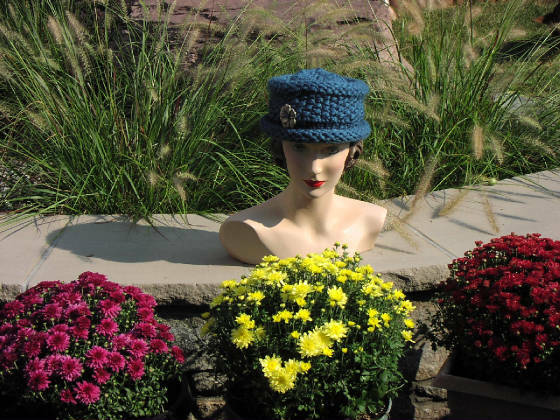 # 458: Variation of # 427 pillbox hat shown above, this one with a large, lightweight floral button from France: $35. 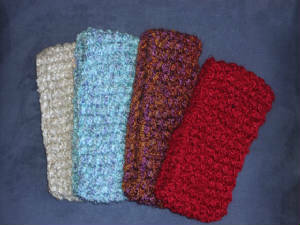 Wool/acrylic, hand washable, air dry flat. 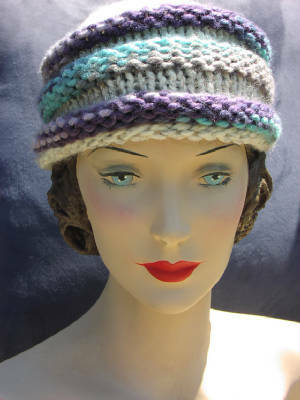 # 462:"Smoky Mountains" bulky acrylic roll brim hat: $35. Machine washable cold and gentle cycle, air dry flat. 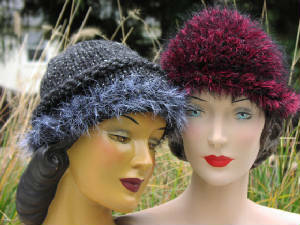 # 405: Wool/acrylic red, purple, gray multi colored hat: $35. Machine wash cold and gentle, air dry flat. 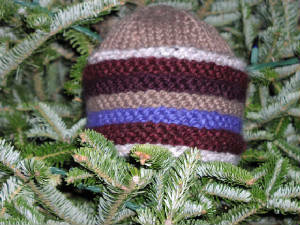 # 377: Earth and Sky: Hat for men or women made with wool/acrylic blend yarn: $35. Machine washable, lay flat and air dry. 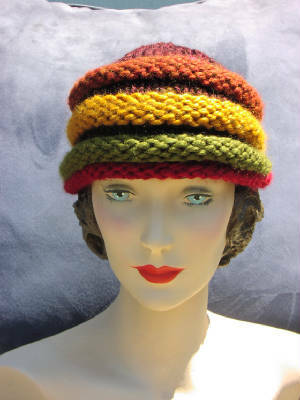 # 411: Wool/acrylic hat in autumn colors: $35. Machine wash cold and gentle, air dry flat. 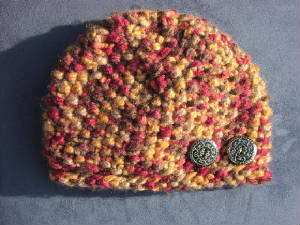 # 410: Roll brim hat in "cottage" yarn: greens, browns, blues and taupe... wool/acrylic/mohair: $35. Hand wash in cold water, gently squeeze (do not wring) excess water, air dry flat. 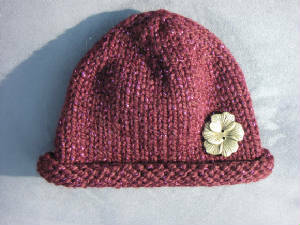 # 428: Sparkly purple hat with large, lightweight floral button from France: $35. Wool/acrylic/polyester can be machine washed in cold water, gentle cycle. Air dry flat. 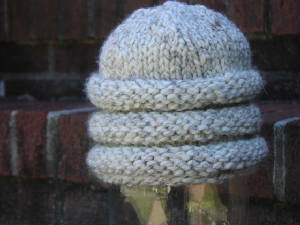 # 421: Wool/acrylic hat in oatmeal...can be made in any solid color of your choice. : $35. Machine wash in cold water, gentle cycle, air dry flat. 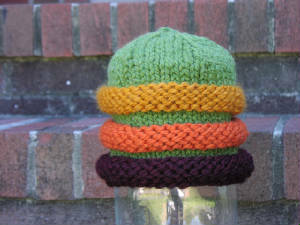 # 422: Wool/acrylic hat in "cilantro", "butterscotch", orange, and "claret"...$35. Machine wash cold and gentle, air dry flat. 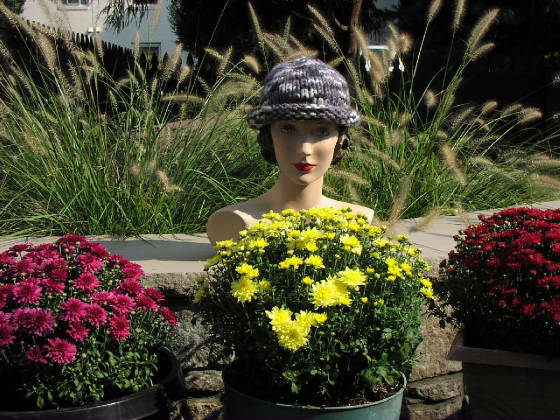 # 429: Cloche style hat with floral buttons from Italy. 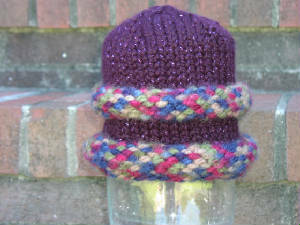 Acrylic yarn can be machine washed in cold water, gentle cycle. Lay flat and air dry. 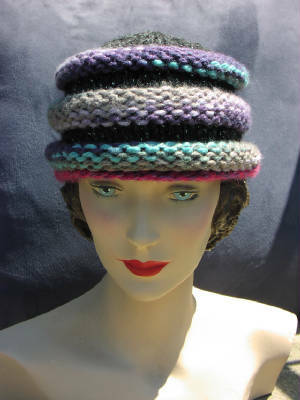 # 423: Wool/acrylic hat in mauve, rose, and claret: $35. Machine wash cold and gentle, air dry flat. 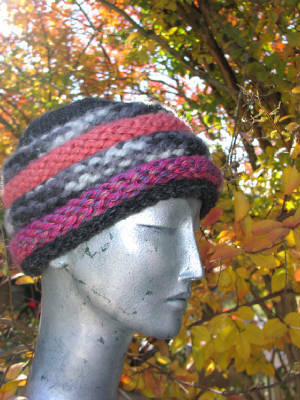 # 417: Wool/acrylic/polyester hat in oatmeal, blues, purples, and "constellation" yarns...with a face framing fuchsia stripe: $35. Subtle silver sparkles like night stars! Machine washable in cold water, gentle cycle, air dry flat. 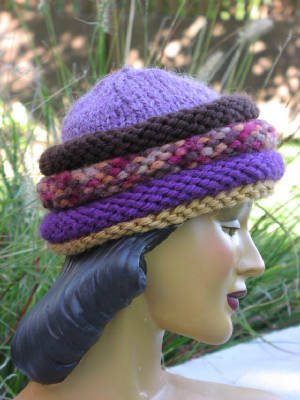 # 416: Hat in oatmeal, blues and purples: $35. Wool/acrylic, machine wash cold and gentle, air dry flat. # 412: Variation of photo above-- oatmeal, purple, red, green....$35. Wool/acrylic, machine wash cold and gentle, air dry flat. 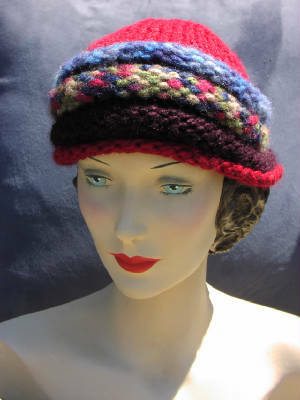 # 407: Wool/acrylic hat in reds, purples, and blues: $35. Machine wash cold and gentle, air dry flat. 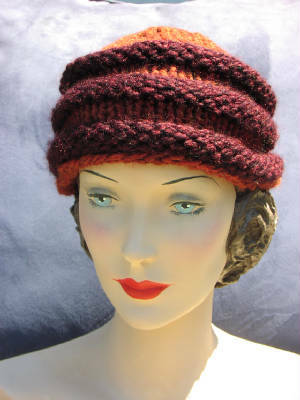 # 413: Wool/acrylic in "spice" and "claret" yarn: $35. Machine wash cold and gentle, air dry flat. 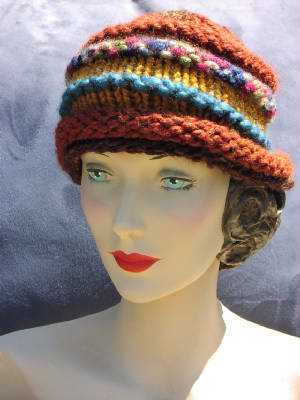 # 406: Wool/acrylic autumn colors with bright teal stripe hat: $35. Machine wash cold and gentle, air dry flat. 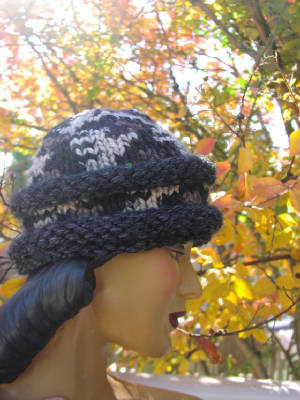 # 414: Hat in "constellation" (dark gray with silver sparkles), blues and purples: $35. Wool/acrylic/polyester, machine wash cold and gentle, air dry flat. 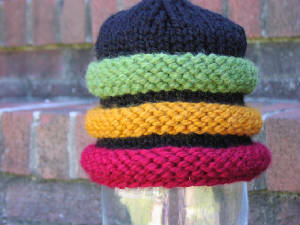 # 415: Hat in red, green, "constellation" and gray: $35. Wool/acrylic/polyester, machine wash cold and gentle, air dry flat. # 419: Acrylic roll brim hat: $35. Machine wash cold and gentle, air dry flat. 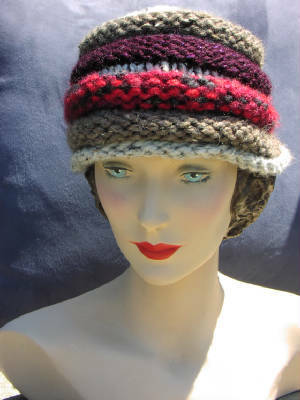 # 424: Wool/acrylic/polyester hat in sparkly silver purple and red multi stripes: $35. Machine wash cold and gentle, lay flat and air dry. 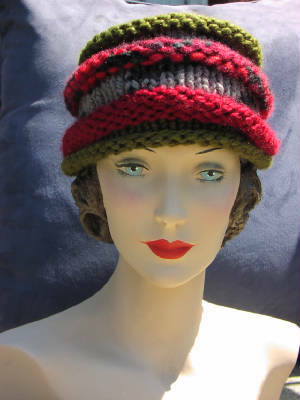 # 425: Crazy fun pillbox hat in wool/acrylic: $35. Machine wash cold and gentle, air dry flat. 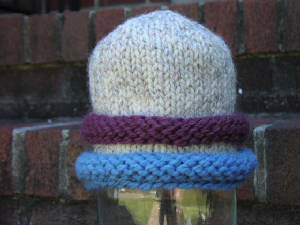 # 426: Wool/acrylic hat in oatmeal, sky blue, and dark purple in a graceful sort of bell shape: $35. Machine wash cold and gentle, air dry flat. 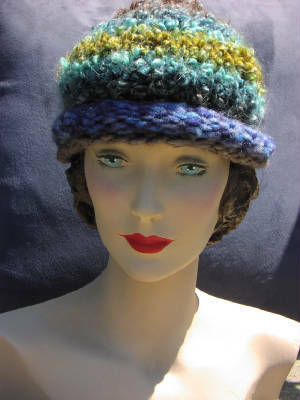 # 420: Wool/acrylic hat in bright colors popping out from black: $35. Machine wash cold and gentle, air dry flat. Shown in 100% acrylic. Custom colors, sizes and fibers available! Prices vary depending on fiber content.